It used to be so easy when the DVD revolution hit. Anyone who wanted to upgrade their VHS collection to the convenient disc format had to but wait for the film or TV series to be released, and unless it was the most niche of titles, those discs would remain available for years and years afterwards. Everyone was buying DVD, and studios could afford to swamp the market with back catalogue titles as well as the latest releases. That’s no longer the case. The market for physical media has been on the decline ever since reliable fast broadband and online content providers carved a chunk out of the market. Companies looking to maximise profits do some serious market research before releasing a Blu-ray, making sure that they press just enough and no more. So while the latest releases continue to take the lion’s share of shelf space, back catalogue titles are less common, and even fall to specialist boutique labels to distribute. Romancing the Stone and Jewel of the Nile may be second tier Indiana Jones clones, but they are a whole lot of fun, and have been a constant mainstay of my movie collection. They were on my list of movies that I was determined to get on Blu-ray, but this time I left it too late to get the UK releases at a reasonable, bargain price. The UK discs may not exactly be getting scarce, but they are few enough in number to demand close to RRP on internet retail sites. To shave a few Euros off the price, I actually went an imported the French twin-pack release, same discs, French blurb. 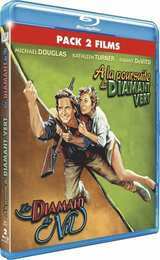 This then is the review for A la Poursuite du Diamant Vert et Le Diamant du Nil. You get two BD discs on either inner face of a thin BD Amaray case. Joan Wilder is a popular romance novelist, who explores her adventurous side through her books, but who in real life is so timid that she has a hard time walking past street traders without feeling intimidated. But it’s to her that her sister Elaine turns for help when she’s kidnapped in Columbia, and the kidnappers demand as a ransom the map that her late husband mailed to Joan. That’s how Joan Wilder winds up in the middle of the Columbian jungle, stranded after a bus crash, and threatened by a mysterious dark figure. Just like in her books, a saviour comes to her aid. But unlike the heroes she writes, Jack T. Colton is anything but respectable or accommodating. But his willingness to help becomes stronger once he sees the treasure map in her purse. Romancing the Stone gets a 2.35:1 widescreen 1080p transfer and it is a good one. The image is clear and sharp, colours are strong and consistent, and the print is clean and stable, other than the slightest wobble seen during the credit sequences. There is a discrete level of film grain, detail levels are strong, and contrast is excellent, with plenty of rich blacks without black crush. It’s a proper, filmic presentation of a back catalogue film. You have the choice between DTS-HD MA 5.1 Surround English, and DTS 5.1 Surround German and French, with subtitles in these languages and Dutch, Danish, Finnish, Norwegian and Swedish. They’ve taken what was originally a stereo experience, and broadened it out with the surround mix, supporting action, dialogue and music in the front soundstage with a hint of ambience from the rear speakers. It works well without ever feeling contrived or forced. The Spanish dialogue in the film is subtitled through player generated subtitles, so the print is clean throughout. The original UK DVD releases were barebones except for the movie trailers. These Blu-rays don’t have the trailers on them at all. Thankfully they have other extra features, many of them taken from a 2006 Special Edition re-release. You get 18:53 of Deleted and Alternate scenes in 1080p. Rekindling the Romance: A Look Back lasts 19:47 (480iSD), and the stars and others are interviewed about the making of the film. A Hidden Treasure: The Screenwriter is a 3:15 tribute to Diane Thomas. Douglas, Turner, and DeVito: Favourite Scenes lasts 3:56 and is self-explanatory. There’s a final word in Michael Douglas Remembers which lasts 2:23. Romancing the Stone still works! It’s still great entertainment some 30-odd years after its original release. There’s something just timeless about a good romantic adventure, and this film throws in no little comedy as well. It’s funny, it’s thrilling, and you can invest in the characters. It also has that smart, metafiction aspect to it, that of a romance novelist living out for real the kind of stories she only writes about, and coming face to face with the difference between reality and fiction, having to rely on a knight whose armour is tarnished. It’s the characters that make it work, with Joan Wilder the dowdy, introverted author whose career is built on her romantic delusions, but who has to come into her own when she travels to Columbia to save her sister. Jack Colton is the self-serving rogue who comes to her rescue, especially when he hears about the treasure, and then of course there is Ralph, one of the kidnappers who has been sent by his brother Ira to keep an eye on Joan to make sure she gets the map to where it’s meant to go, but who gets dragged into the same scrapes that Joan and Jack do, when they’re pursued by the villainous and corrupt Zolo. It’s the combination of a great story, and these great characters that makes Romancing the Stone a timeless classic. Its fast moving plot is full of twist and turns, but it never lets go of the comic heart of the story. It’s one of those rollercoaster rides where you get off at the end only to go and queue up all over again. The worst thing you can do to a romance novelist is give her a ‘happily ever after’, a requited love. That’s why halfway through a round-the-world adventure, Joan Wilder is hitting writers’ block, just as her romance with Jack Colton is hitting the skids. The chance to write a biography of an up and coming North African leader offers just the change of pace she needs, but Omar Khalifa is hardly the benevolent sort. He’s the kind of person who has Jack’s boat blown up to stop him coming after Joan. Luckily, he wasn’t on the boat at the time, but unluckily, he’s run into Ralph, the little guy from Cartagena who was also after the emerald. Ralph wants revenge, but before he can get it, a Sufi assassin demands that they help him get back the Jewel of the Nile, which Omar has stolen. Jewel of the Nile’s 2.35:1 widescreen 1080p transfer is even better than that of Romancing the Stone. Once again, the image is clear and sharp, colours are strong and consistent, and the print is clean and stable. There is a discrete level of film grain, detail levels are strong, and contrast is excellent, with plenty of rich blacks without black crush. The only problem is that it shows up the creaky effects even more. Romancing the Stone was pretty much a practically shot film, but Jewel of the Nile has some composite effects work, and you can really see the seams in the effects. One more time you have the choice between DTS-HD MA 5.1 Surround English, and DTS 5.1 Surround German and French, with subtitles in these languages and Dutch, Danish, Finnish, Norwegian and Swedish. The surround mix once again does the film justice, really immersing you in the action, and bringing the film to life. It’s a particularly dynamic track, one where the explosions and gunfire are thunderous compared to the dialogue levels. You might be tempted to ride the remote for the duration. The sequel gets a director’s commentary from Lewis Teague. There are six deleted scenes on the disc running to 5:44 and in HD. The theatrical trailer is in 480i SD though. There are a couple of featurettes too, Romancing the Nile: A Winning Sequel lasts 20:59, and presented in 480i is a retrospective making of, made for the 2006 DVD release. Adventures of a Romance Novelist lasts 8:02, and looks at the lack of ‘happily ever after’ that motivates this film’s plot. Jewel of the Nile is fun. It’s entertaining, brash, and likeable, and from a more innocent time, when cultural sensibilities didn’t stand in the way of telling a great story. Besides, Jewel of the Nile is a rare Hollywood film that actually shows Islam, or at least one sect of Islam in a positive light. Even still, it wouldn’t be made today for fear of causing offence to someone. Jewel of the Nile is not a patch on the original film. It has the usual eighties sequel approach of merely remaking the first film, albeit with a different colouring. It’s another adventure to find a treasure, and once again, a romance novelist is living out one of her stories in real life. This time it’s about Jack and Joan rekindling their romance rather than falling in love, and the nature of the treasure is more esoteric than a simple stone. More importantly, whereas the original film was an action movie which drew comedy naturally from the situations, in the sequel the comedy seems deliberate and forced into the plot. It was a rule once upon a time that sequels were never as good as the originals, and Jewel of the Nile exemplifies that. But it is fun to watch, and serves to entertain for a couple of hours. It may be politically incorrect, especially in terms of casting in ways that would have Twitter in a meltdown these days, but I actually miss those more innocent days when you could enjoy a film for what it was, without stressing for months about the production beforehand. For the UK they may be new extra features, but in terms of extras, these discs may as well be over ten years old. There’s nothing new in that regard. But when it comes to high definition presentation, both Romancing the Stone and Jewel of the Nile get the kind of treatment that few back catalogue titles receive. There’s very little DNR or post-processing here, just a couple of classic eighties romantic action-comedies looking as good as you’re ever going to see them. Finding a copy of this release has been hard!